The taxi pulled up to a blocked off street in Tepito. Today was October 31, Halloween, and I was drawn to see Her. This was my second full day in Mexico City. I do not speak the language—I went by myself. 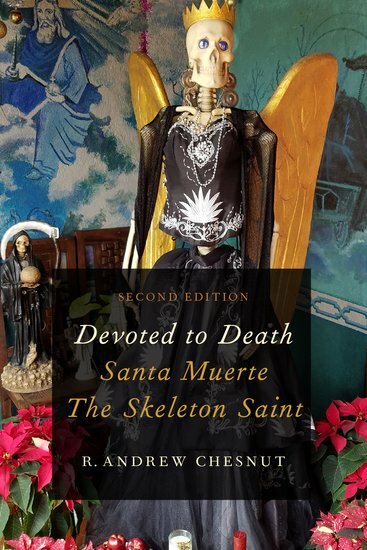 I might have looked out-of-place dressed as I am—all in black, a studded vest with chains; 2-tone bihawk, from a culture far away—Jersey City—where my apartment is home to many icons of Santísima Muerte. Her image has moved me since I picked up a small red translucent figure at a botanica in Queens many years ago. I walked past the caution tape tied between 2 cones and joined the celebration on Calle Alfareria. She was everywhere— Santísima Muerte. She was in black, gold, red or white; in beautiful lace dresses. She was tall, and small, and locals were carrying her in their arms much like a child. If you needed a new dress for your Saint there were vendors at the end of the street—some of the dresses had traditional Halloween patterns, bats, witches and skulls. Other vendors had traditional Halloween masks, and skeleton decorations—this was the apex of Halloween and Dia de los Muertos in the land of Santísima Muerte. As the street ran its length and ended at an open market, on the sidewalks were set mini altars of Santísima Muerte. She was surrounded by candy, cigarettes, paper flowers; adorned with beads. Her followers blew cigar smoke to envelop her in one of her favorite aromas. A worshiper would begin a chant in her honor and the whole block would join in reply. A Mariachi band sung in Her honor, and sheet cakes were arrayed under a tent for the celebration. I love her with my hand over my heart. I was handed a red statue (did they know I needed love I thought?) and beads and a prayer sheet. A man with tattoos covering his chest handed me a small gold figure and I attached Her to a chain and safety pin to my vest. At the main altar I explained “No hablo español” and was allowed in back to browse the shop filled with statues and candles by Enriqueta Romero (affectionately known as Doña Queta) —this was her altar and expression to Santísima Muerte. I then moved to the main space where others were praying. Here She stood – life-sized in white like a bride, with long dark hair, surrounded by other figures in white with half faces—one side a woman the other a skull and gold chalices. I felt embraced from the moment I entered the space, moved as if in religious ecstasy. My eyes flooded with the power of Her image. I was given gifts by the community of devotees, and I left gifts for Her. I placed the red Santísima Muerte on a Halloween cloth on the sidewalk and sat with her and watched the celebration. It might be an experience I hold for my life. *Heather Buckley is an award-winning FX supervisor and producer who resides in Jersey City, New Jersey. Follow her on Twitter. Beautiful photos and great narrative…thanks!